On February 13, 1899, newspaperman Archibald Campbell died at age 65. 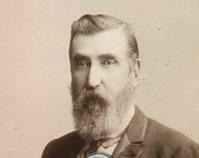 A graduate of Bethany College, he became editor of the Wheeling Daily Intelligencer in 1856. At the time, the Intelligencer was the only daily Republican newspaper in Virginia. During Campbell’s first years at the paper, the country was rapidly plunging toward civil war. His editorials opposing slavery and secession often stood out as a lone pro-Union voice in the region’s press. And Campbell was also the only newspaper publisher in Virginia to endorse Abraham Lincoln for president in 1860. After Virginia seceded from the Union at the start of the Civil War, Campbell denounced the action as “infamous.” He quickly emerged as one of the leading proponents of West Virginia statehood. And when Lincoln was undecided about admitting West Virginia to the Union, Campbell sent the president a moving telegram, urging him to sign the statehood bill. He wrote, “If the bill fails, God only knows the result. I fear a general demoralization. I am clear. The consequences are in your hands.” Days later, Lincoln signed the bill, making West Virginia the nation’s 35th state.